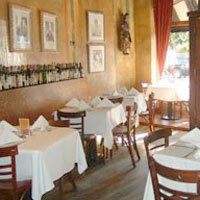 "This quaint, friendly trattoria features delicious Italian standards with a touch of zing. A casual atmosphere is a perfect accompaniment to large portions of antipasti, insalate, pasta pomodoro, and gamberoni alla diavola which is spicy shrimp with herbed garlic lemon oil, accompanied by creamy polenta. 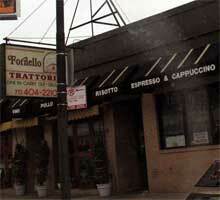 Other menu items include lamb, trout, meatloaf, chicken, sausage, and delicious desserts such as tiramisu." "This cheerful, roomy family-owned restaurant sets the tone with piped-in opera music and a mural of the Italian seaside. Wood-fired thin crust pizzas are the house specialty. Other menu items include Italian favorites such as bruschetta, calamari, rotolo with ricotta, prosciutto and spinach, homemade gnocchi, veal sauteed in lemon-caper sauce, and more."